The landowner said he had a beaver problem, and he brought aerial photos to prove it. That’s not unusual nowadays, with such images easily downloaded from the internet. It certainly makes it easier for me to pinpoint problems and find my way around. Back in the day, I spent a lot of time exploring uncharted territory. The man also brought an old-fashioned paper topo map on which a local who hunted the place year-round had penciled in the general shape of the beaver pond and marked the deepest water. The map indicated a “creek” flowing across one edge of the property. I put that in parenthesis, because it had been channelized many years before and was now no more than a large ditch running straight as a rifle shot. As is customary, the new course had been renamed Beaver Creek Canal instead of just Beaver Creek. Every intuition told me the big beaver pond had to drain into that canal, and finding where the beavers crossed over between the two would be the key. The landowner seemed genuinely alarmed to find out he had so much land underwater, and I agreed to go out and take a look the next day. It didn’t take long to find the beaver pond. The dam stretched for hundreds of yards. I had no idea how old the pond might be, but the timber in the center of the pond was dead and gone except for a few ghostly spires that stuck up in the middle. I saw eagle nests in the tops of two of those spires and started calling the place Eagle Nest Pond. I drove the outside perimeter on my four-wheeler to where the water was supposed to be deepest. Generally, that means an old drainage channel. But all I found on the outside of the dam, here, were a couple of shallow sloughs that weren’t even knee deep. I kept looking for the main crossover from the pond to the ditch canal. I hit a patch of flooded timber, figured it probably wasn’t a good idea to ride off into that, dismounted and set out on foot. I waded far enough in that I could see nothing but water all around, turned and walked back out to my machine. By the lay of the land, I reckoned the creek ran in a certain direction. But the compass needle said otherwise, and trusting that the magnetic poles had not shifted since I checked the map back at the truck, I followed the compass instead of my intuition. I found the creek canal and also a low beaver dam. Chewing on the trees along the bank indicated recent beaver activity. The trick would be getting down that nearly vertical bank to make a set. I started back to the truck, stopping to set a 330 in a deep run I had stumbled across while wading above the dam. The run went right between two small trees, offering a perfect setup. I put a small limb across the top for a dive pole. I also set a 280 in one of the shallow sloughs below the dam, thinking an otter might take that route. The next day, I came back with my friend, Ric McCaslin, determined to solve the mystery of the pond. Rain the night before had left a few inches of new water, but nothing we couldn’t handle. We went straight to the creek and then set off along the bank, looking for an outlet from the pond. We walked at least half a mile, at one point getting close to the patch of flooded timber that had waylaid me the day before. We found a dryland otter crossing but no connecting water and no beaver crossings. Eventually, we came to an open field, and looking down the edge of that field, I could see the parked truck. We had checked every side of the pond finding neither an inlet nor an outlet. So I went home, broke out the topo map, and studied that. From the map, it appeared as if the huge beaver pond followed one of the meanders of the original creek, flowing parallel to the straight, channelized canal but not into it. The little sloughs I had found were, in fact, the only drains for the pond. But they held so little water beavers didn’t use them to get from the pond to the canal. In effect, the vast beaver pond was a self-contained habitat. Exploring on foot, I found a series of small field drains that fed into the upper end of the pond. They carried only run-off water and were dry at the time, distinguished only by the leaves having been swept from finger-like channels that crawled across brush land. Yet this was the water source that fed the huge pond. The beavers were living in an isolated colony, and that would make them hard to trap. Generally, I have my best luck intercepting beavers as they come and go from a pond, and the dam crossover is far and away my favorite set location. But that wouldn’t work here, because there wasn’t any crossover to set. The pond itself was almost a shallow lake, and there wasn’t any way to focus the beavers in any one area, either. Well, there was one way, and I decided to use it even though I usually only do it as a last resort. I would break the dam. That seems to be the first choice for many would-be beaver trappers, yet it is actually hard to catch a beaver at a dam break. Beavers do note the water flowing out of their pond and are quick to come and repair the damage. But they are always bringing something with which to repair the break, and traps set at the break get plugged with mud and sticks. They are more likely to become part of the dam than they are to catch a beaver. One trick is to set the trap away from the break itself. If I can find a good force point near the edge of the dam, I may use it to make a double break set, essentially two holes in the dam with the trap set in between. Here, I picked a pair of small willows that grew in the water a foot or so offshore. I attached a snare to the trees and also a support wire. Then, about 2 feet to either side of the tree, I scuffed shallow holes breaching the dam. The hope is that when a beaver works on the holes, it will take the shortest route between, which leads it into the snare. I made two sets like this off the deep end of the dam, opposite the little sloughs. 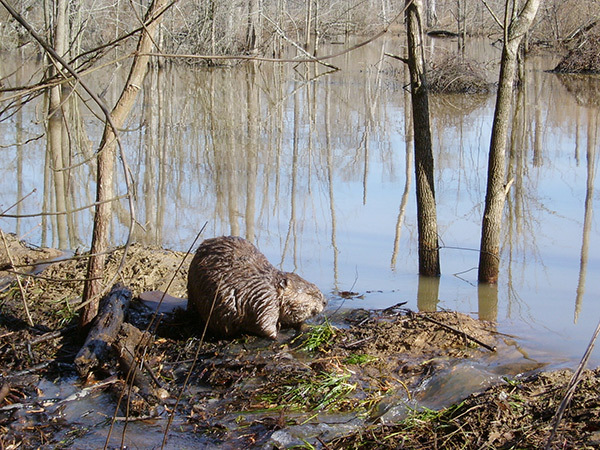 When the snares were knocked down and pushed up in the mud, I realized I had made the breaks too close to the snares and the beavers had still been pushing mud when they hit them. I reset the snares and made new breaks a little farther apart. The other set I used here was a foothold at a single break in the dam, made with a couple of twists I had seen in Paul Dobbins’ video Summertime Beaver Control. An inexperienced trapper might try to cover a dam break by simply sticking a 330 in it. That’s an exercise in futility. You don’t want to bed a foothold in the break, either, because, nine times out of 10, a beaver will just cover it with mud. And if you set the trap beside but not in the break, the beaver may scoop it up with the mud used to repair the break. The twist is to bed the trap in the precisely right place, and you find it by measuring out from the dam with your forearm. Put your elbow against the dam break at the water line and reach out with your hand. Your palm lands on the water directly over where you want to bed the trap. It might be shallow or it might be deep, depending on the contour of the dam. It works because you are targeting the beaver’s back foot, and a beaver isn’t going to be carrying anything in its back feet. You also want to bed the trap well below the surface, so the beaver won’t scoop it up. The second twist is to pin the trap in place. I do this with two round stakes, 12 to 18 inches long. I nestle the trap in the bed with one lever pointed toward the dam and one away from the dam. Then, on the side of the trap away from the dam, I drive the two stakes snugly on either side of the lever, pinching the trap in place. Leave the stakes sticking up 4 to 6 inches above the trap so that when a beaver hits them it will rise up over to continue forward. After the beaver clears the stakes, hopefully it will settle back down and step in the trap with a back foot. I made two of these sets, each trap fastened to a slide wire anchored with a concrete block. The depth was marginal for drowning a beaver here, another good reason to target a back-foot catch. Even when a beaver doesn’t drown, it rarely escapes when held by a hind foot. That came to pass here—twice. Each time, an extra-large beaver managed to drag the block into shallow water. I had to dispatch them, but they didn’t escape. The beavers I caught in the snares were all alive, too, except for one, and I don’t know what caused it to expire. In the shallow end of the pond, close to where I drove in, I noticed a log lying perpendicular to the dam. I waded out to check, and, sure enough, found a channel carved underneath. This gave me another place to make a set. I set a 330 under the log, followed the channel about 10 yards to the dam, and kicked a sizable hole. I figured any beaver coming to fix that break would likely take the channel and dive under the log into my trap. The set produced two beavers. The channel set between the trees in deeper water produced two more. I think they were on their way to repair the dam break, too, and got waylaid before they reached the log. A 330 set down in the canal also caught a few beavers. Whenever it rained, the water flow set off the trap, but it was productive, well worth maintaining. For me, breaking a beaver dam is usually a last resort. But these beavers were living in a self-contained habitat with no regular travel routes to set. The breaks in the dam got them moving in predictable ways. All said and done, I took 18 beavers off the property, and, truth be told, I know I didn’t get them all. The landowner has asked me to come back, and when I do, next time, I’ll know what I’m up against.